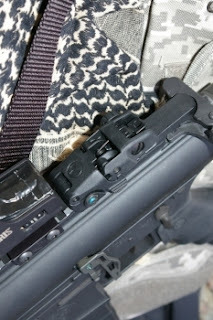 When I needed a back up sight for my DPMS AP4 I looked at a lot of options. As I have been a fan of high end plastics and a HUGE fan of Magpul PMags I thought one of the Magpul MBUS deserved a try and for under $50 vs the other $75+ options. Mounting was event-less on my AP4 and has not moved or budged since. Many would say you need some fancy hex machine screws to hold it on, however the MBUS have a flat head standard screw tipped with lock tight. The result is a easy mount with only a swiss army knife and with the lock tight it stays put and believe me I have made it a personal challenge to shake it loose. The back up sight folds flat and provide a uncluttered picture of my Burris FastFire II reflex sight, but are only thumb or finger flip away from a quick pop up for fixed sight shooting. The price is excellent for the quality and I doubt you will be able to push the durability of the MBUS hard enough to ever break it. Overall great value in the sight market. 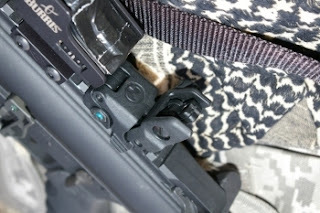 One thing I did that I was surprised Magpul did not think of was a adding a notch on top of the sight for close CQB ranges. I added a shallow Dremal tool notch on the top of the sight and it puts me right on target for the 7 yards CQB ranges. The dual flippable apertures are nice and work fine however I would have liked them to work with accessory rear sight inserts. If I want to go with a Trijicon front and rear sight set, I will need to swap to a different sight that would accommodate the standard sight blade insert. 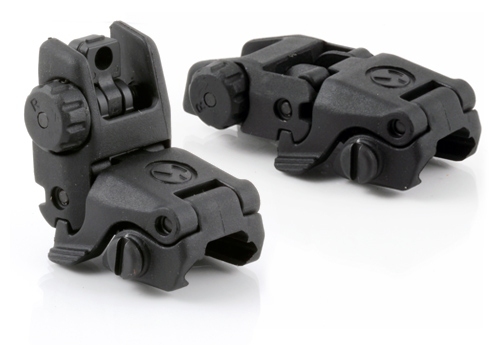 Fixed rear sights are typically in the domains of Daniel Defense fixed rear, however for a flip down back up sight the Magpul MBUS Rear Sight is excellent quality, a great deal, huge value, and fills the need. Due to the timing I purchased and tested the Gen I version however Magpul now has the Gen 2 version which is a bit slimmer to slide under scoped rifles a bit better. This original version would be a bit fat to fit under scoped rifles.